India is one of the best and the most favored tourist spots, not only for the people touring within India, that is the Indians, but also for people who come to visit India from around the world. Who belong to diverse places, have various cultures and traditions that they follow, and are also looking for something exciting and adventurous in their touring expedition. They know that India is probably the best spot to be in, especially when it comes to adventurous sports, as it has an array of options from which you can choose when you are willing to outdo the stress by getting into some real fun and exciting sports. One of the places where you will find almost all the adventurous and exciting sports, right from Para-Gliding Angling to Mountaineering and Trekking to skiing and many more is Manali. This is the place where the skiers can truly get to experience the best when it comes to skiing, as this is one among few of the places around the world where you can ski not only in the winters but also during the summers. Apart from that there are a lot of facilities provided to the onlookers, and tourists when it comes to mountaineering and trekking, or even when it comes to Para-Gliding Angling as well. Having said that, adventure sports in Manali is a one of the major thing to get experience from and it is not only in Manali that you can found these games precisely, there are also other parts of the country as well where these adventurous games are played. Hence, let us now look into them one by one. • Skiing – This is probably one of the most favourite sports as well as passes time for one and all. This is probably because via skiing you will get to encounter the snow covered mountains of Himalayas pretty closely. The places apart from Manali where you can get to have a skiing facility or let us just say experience skiing are Patnitop as well as Gulmarg which are places in Jammu and Kashmir. Apart from Manali there is also Kullu where you can get to ski, and one other place providing the similar facilities is Kufri which is located in Himachal Pradesh. There is one more place named as Auli which is in Uttarakhand where too you can get to ski as much as you can or wish for. • Mountaineering – One of the best sport when it comes to keeping one fit and fine. Mountaineering gives you a chance to rendezvous with the deep forests, and feel the warmth and closeness of nature. Same as skiing, even mountaineering is also available in Manali, apart from that you will also find it in Leh, Ladakh, Himachal Pradesh, Ooty and also Sikkim. • Para Gliding – This is probably the most breath-taking sport of all. We say this because this is one sport which will take you off of the ground and will allow you to fly high. 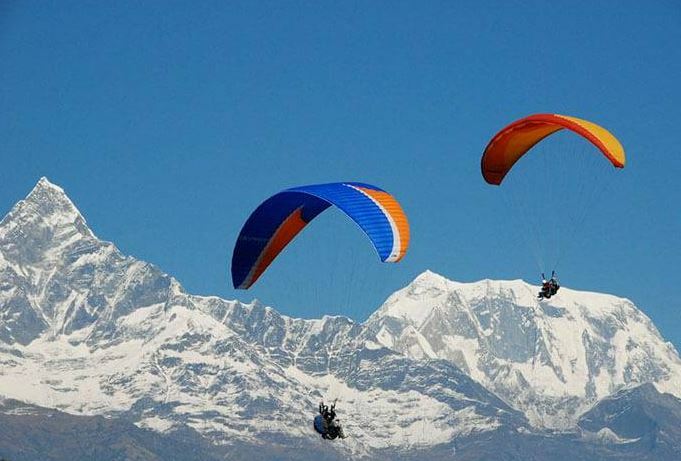 You will get to experience Para-Gliding in many parts of the country apart from Manali, one other place where Para-Gliding is pretty prominent is Kangra district which is located in the state of Himachal Pradesh. • Hot Air Ballooning – This is one of the last when it comes to the list of adventurous sports, but most certainly not the least, as this is the sport via which you will get a bird’s eye view around the place where you are probably lodged. The place prominently providing this facility is Safdarjung which is in Delhi, apart from that you will also find this sport being exemplified in Manali, Jaipur, Dharamshala and also in Ranthambore. This entry was posted in Manali. Bookmark the permalink.